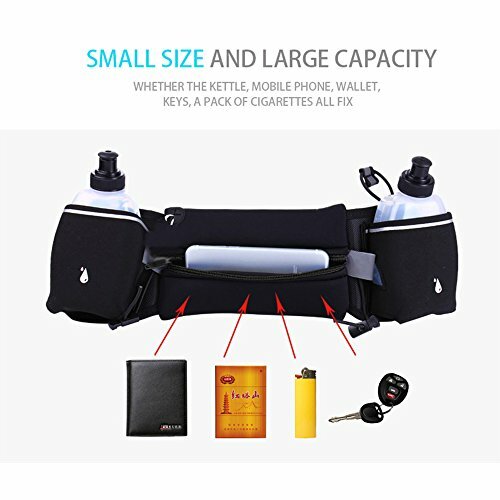 - Large enough pocket to carry your phone, keys and credit card/ID along with you. - Fits most modern day smartphones, iPhone X, Samsung Galaxy S8 & Note, HTC, etc. - No Chafing and doesn't add bulk so you won't get weighed down while running. Most of our customers say they don't notice it is there in the first place! - Carry your entertainment while running. Attach your headphones to listen to music so you enjoy your runs. - Keep your ID's and credit cards safe. This will make sure you don't lose them and you have access to your funds. - Love it or your money back. 100% guaranteed. If you don't like it, just send me an email and I will give you a full refund. That's how we believe in it. We are sure you will like it, but if for any reason you don't, you won't be out of pocket. LARGE ENOUGH POCKETS: This is probably your main concern. The pouch is large enough to fit most cell phones. Even the large beasts :-) Like the Apple iPhone X, Samsung Galaxy S8, & HTC. Beware though, if you have monster case like the OtterBox, it will be a tight fit. Best to take it off. Your credit cards and ID's will also fit in the black pocket. The belt also has 4 elastic straps which are great for hanging other things - keys, race bibs, gel packs. SNUG AND LIGHTWEIGHT: You will hardly notice you have the runners belt on because the waist pack is lightweight. You will be amazed at how snug it fits and how you don't get weighed down at all unlike other hydration belts. This is a good thing because you don't want anything impeding your run. Perfect for men and women. NO SLIP, BOUNCE, OR RUB with ADJUSTABLE NYLON STRAPS: This Runners Belt/Fuel Belt with super soft, lightweight Neoprene and anti-slip inner layers make sure there is no slip, bounce, rubbing, or chafing while running for the best sung fit. This belt fits most waist sizes (28" to 38") with adjustable nylon straps and strong buckle clip. NEVER CARRY YOUR WATER EVER AGAIN: Stay hydrated with easily accessible (2) 10 oz BPA-free, leak-proof water bottles for running belts. Enough even for longer runs, race, hiking, camping,cycling. Great as hiking belts /waist pack. ANTI-SLIP TECHNOLOGY FOR ULTIMATE FIT AND COMFORT! Designed to be worn on the hips, it fits ANY size from 27" to 47" (for both women & men). The "No Bounce" Fit stays perfectly snug against your hips, which is vital for runners. The more you use it, the more you'll love it! If you have any questions about this product by Anbage, contact us by completing and submitting the form below. If you are looking for a specif part number, please include it with your message.